Stamps At Play: Christmas Countdown! These are tags I made (inspired by a couple challenges :) for those little gifts. It's a Holiday TAG-Stravaganza over at Try Stampin' On Tuesday. What a perfect challenge! 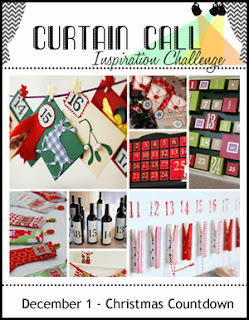 Curtain Call has a Christmas Countdown Inspirational Challenge...just 24 more days til Christmas!! These are awesome! Love the whimsical designs. 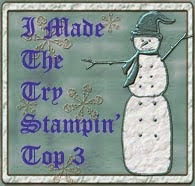 A great way for kids to count down, Thanks for playing at Try Stampin'. What a wonderful tradition. I too use a calendar that I give my "kids" who are grown men now but would miss it terribly if I didn't send them their calendar each year. My son is a Marine in Japan and his calendar was damaged in transit so he was bummed out, but it's the thought that counts. You've put in a lot of work. Thanks for sharing it with us at Try Stampin' on Tuesday. Kathy (DT). Fabulous idea...I love to see the "traditions" that others use with their children (even though they are practically grown). My three "children" are all grown up and still love to see me drag out decorations from when they were little. Great idea and such creative tags all so different! WOW! What a fabulous project, Kathy! Each Tag is beautiful and unique! Thanks so much for playing along at the Curtain Call! You are AMAZING! This is such a fabulous idea and the tags are so fun! Oh wow, those tags are fabulous! I love every one of them!! What a cool tradition with your daughter. Thanks so much for joining us at Try Stampin' on Tuesday. Hope to see you again soon! Wow, what a fabulous project, Kathy! Love all the gorgeous details! Hugs from Finland! Yes, this is a tradition so important to carry on; your calendar is not only gorgeous, but soooo thoughtful and heart-warming! I've started a similar tradition with my niece - now on her second one - and my nephew - with a first. LOVE creating for those little ones; it makes the spirit of Christmas sparkle! !